Wondering how the insides of the Mahindra KUV100 NXT EV look like? Get a tour of this car with the 360° degree view of the interior. Enjoy a lifelike view of the interior design of this car. Check out how the manufacturer has utilized the space and how spacious the legroom as well as the headroom are. Get a feel of the quality of the material used and see how the dashboard looks like. Check AC vents, infotainment system and other utility equipment on offer. See if the car offers steering-mounted controls. In a nutshell, this 360° degree interior view walks you through the inside of Mahindra KUV100 NXT EV. Click anywhere on the image and drag it to the left and right to rotate. Zoom to enlarge the view! Mahindra India has set new trends in the Indian car market with the introduction of its electric range of vehicles. The upcoming Mahindra KUV100 Nxt EV model exteriors would be upgraded with the facelift for body panels, a new front grille with chrome inserts and a new set of colour options. The interiors will have the options of five-seat and six-seat versions as in the existing model. The safety features of dual front airbags, ELR seat belts and parking assist system can be expected as a standard. The Mahindra KUV100 Nxt EV exteriors will have a new bumper and bonnet design with stylish contours and chrome inserts in the front grille, giving it a refreshing image. The side body will have electrically adjustable/foldable ORVMs with integrated indicators, body-coloured door handles and a new set of alloy wheels. The new tail lamps with roof-mounted stop lights, body-coloured rear bumpers and the New KUV NXt EV badge in chrome will give it an elegant stance as a premium electric vehicle. The Mahindra KUV100 Nxt EV interiors will have the options of five seat or six seats as in the existing model. The instrument cluster will have the Odometer rollover support, and display of status of charge and distance that can be covered before battery needs a recharge. The comfort features of air conditioner with heater, touchscreen infotainment system with steering-mounted audio controls, and utility features of bottle holders and cup holders at key locations would be offered in this model. 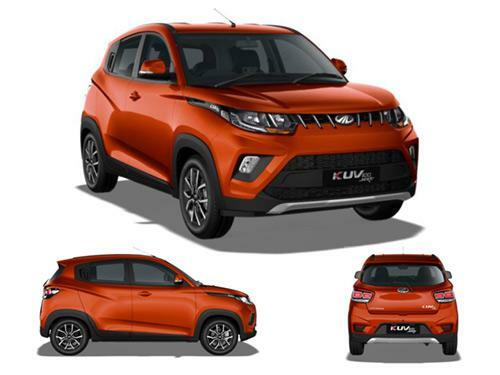 The Mahindra KUV100 Nxt EV would b powered by the three-phase AC induction motor with a high order of 50-75 PS depending upon final configuration of the model, overall weight and the power requirement for covering long distances. The direct drive transmission with two forward drive modes can be expected for this electric vehicle. The Mahindra KUV100 Nxt EV mileage is expected to be in the range of 100 km to 150 km with one full charge. The actual distance coverage per charge can vary slightly depending upon the overall weight of the vehicle and final specifications of the model. The Mahindra KUV100 Nxt EV braking system will have disc brakes at the front and drum brakes at the rear. The regenerative braking system would be featured for converting heat energy liberated during braking into useful electric charge. The safety features of dual front airbags, seatbelts, collapsible steering column, rear seat child safety locks and speed-sensing auto door locks would be offered. The advance safety features of pedestrian protection system and parking assist system can be expected for this model. The upgraded motor delivering higher power and torques will deliver spontaneous power at the road wheels for reaching top speed at a very quick pace. The power steering with a sharp turning circle radius and comfortable posture of the driver, and easy-to-operate controls with no need to operate clutch as in the conventional vehicle will assist for easy maneuvering. The easy-to-charge battery with long range charge back-up and the regenerative braking system will be a great advantage for taking the vehicle on long drives. The Mahindra KUV100 Nxt EV will have the superb combination of impressive exterior design and long range drivability with one full charging. The versatile interiors with superior quality of fit and finish, and comfort features would make it a grand selection as an electric car. The Mahindra KUV100 Nxt EV competition would be with the sibling model e2o electric car and the upcoming Tigor electric car from Tata Motors. The versatile interiors, and the motor with high power output and long range capability would be the boosting factors for this model.